Google - BAGHDAD (AP) — U.S. Secretary of State Hillary Rodham Clinton sought to assure Iraqis on Saturday that the Obama administration would not abandon their country even as it presses ahead with plans to withdraw American troops amid a recent surge in violence. Clinton said the drawdown would be handled in a "responsible and careful way" and would not affect efforts to improve Iraq's security forces, or complete reconstruction and development projects. But Iraqis, and particularly their security forces, need to overcome sectarian and other differences if they are to build a united, secure nation, she said. "Let me assure you and repeat what President Obama said, we are committed to Iraq, we want to see a stable, sovereign, self-reliant Iraq," she told a nervous but receptive crowd at a town hall meeting at the U.S. Embassy in the capital. "We are very committed, but the nature of our commitment may look somewhat different because we are going to be withdrawing our combat troops over the next couple of years," Clinton said. Iraqi Foreign Minister Hoshyar Zebari welcomed the overture. "The secretary's message today to all of us was a very assuring message that the United States would continue to support the efforts of the Iraqi government and the enhancement of Iraqi security and stability," he said later at a joint news conference. He also said he had reaffirmed the government's commitment to the timetable despite concerns that the uptick in attacks could prompt a need to reconsider a June 30 deadline for the United States to withdraw combat soldiers from Iraqi cities. "We are doing our utmost and we are coordinating very closely with the multinational forces to ensure that there is no vacuum when that happens, that security is viable," he said. On her first trip to Iraq as America's top diplomat, Clinton said the country has made great strides despite the recent surge in violence. High-profile attacks this past week primarily targeted Shiite worshippers. More than 150 people, many of them Iranian pilgrims, have died. "I condemn these violent recent efforts to disrupt the progress that Iraq is making," she said at the news conference with Zebari. 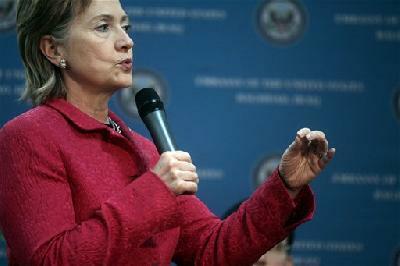 Clinton called the attacks a sign that extremists are afraid the Iraqi government is succeeding. Iran's supreme leader blamed the United States and Israel for the attacks. "Dirty hands and evil brains that founded this blind and uncontrolled terrorism in Iraq should know that the fire will burn themselves," Iran's state TV quoted Ayatollah Ali Khamenei as saying on Saturday. "It is disappointing for anyone to make such a claim since it is clearly traced to the al-Qaida remnants and other violent groups who wish to disrupt the progress of Iraq," she said. Clinton also praised the restraint shown by Iraqis in the aftermath. "These are tragic and terrible events, but they do not reflect any diversion from the security progress that has been made," she said. "They are certainly regrettable and horrible in terms of loss of life, but the reaction from the Iraqi people and Iraqi leaders was firm and united in rejecting that violence and refusing to allow it to set Iraqi against Iraqi, which is obviously one of its intended goals." Violence is at its lowest since the months following the 2003 U.S.-led invasion. But sectarian attacks have exposed gaps in security as Iraq takes over from U.S. forces in protecting the country. Prime Minister Nouri al-Maliki has ordered a military task force to investigate the attacks as well as shortcomings that allowed the assailants to slip through. The government on Saturday also ordered heightened security at major Shiite shrines. The Pentagon plans to hand over responsibility for most urban security in about three months as part of the administration's goal of a complete exit of forces by the end of 2011. U.S. officials say they remain committed to a June 30 deadline to move all forces outside major cities, including Baghdad. But the top U.S. commander in Iraq, Gen. Raymond Odierno, has said American troops could "maintain a presence" in some cities if requested by the Iraqis. "Frankly, some people are afraid," said one participant in the town hall who said many questioned the ability, competence and neutrality of Iraq's security forces, given the U.S. withdrawal plan. "There is nothing more important than to have a united Iraq," Clinton replied. "The more united Iraq is, the more you will trust your security services. The security services have to earn your trust but the people have to demand it." "We will be working closely with the Iraqi government and the Iraqi security forces as we withdraw our combat troops, but we need to be sure that all of you are supporting a strong, nonsectarian security force and we will work to try and help make that happen," she said.